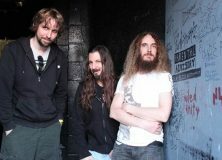 The Aristocrats were born out of serendipitous happenstance back in 2011, when bassist Bryan Beller and drummer Marco Minnemann approached guitarist Guthrie Govan to be a last minute fill-in for a one-off gig at NAMM. The chemistry between the three was so undeniable, later that year they recorded and released an album. You may recall our review of The Aristocrats’ self titled debut, which you can read here. Since their debut album, the group has firmly established themselves as one of modern instrumental music’s most powerful of power-trios. The band went on to tour the world quite extensively, getting to know each other’s playing styles and personalities better and better along the way. At the tail end of 2012, the band put out their 2nd release, a live DVD and Double CD of a performance in Germany called BOING, We’ll Do It Live! Culture Clash is another collection of nine original songs (three compositions from each member) that are once again brimming with tasteful and virtuosic playing from each member. 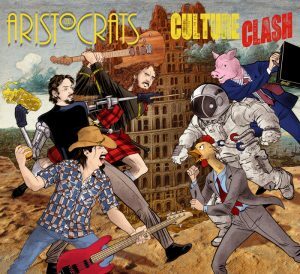 But like their first record, it’s not just a show-off fest of three very capable musicians; The nine songs on Culture Clash are also masterworks of creativity and musicality. 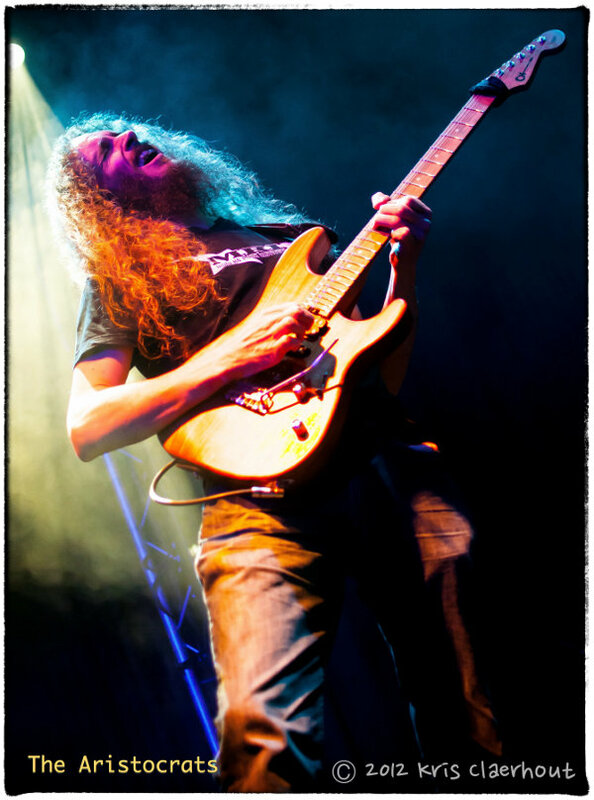 We recently had the opportunity to chat with Bryan Beller and Guthrie Govan. They told us about their development as a band, their experience recording for the new album and what they look forward to on their upcoming tour. How was the writing for Culture Clash different now that you guys have been playing and touring together for a while? Bryan: There was definitely an impact from all of the touring we did together over the past 18 months. We got to know each other a lot better, we shared our iPods, we played improv sections over and over, just everything. So we all felt more comfortable taking more chances with the writing, which I think turned out to be a very good thing. Guthrie: I think that all the gigging we’ve done since we made that first album has confirmed one thing: whatever kind of distinctive “sound” we have as a band is more a product of how we play, rather than what we play. Knowing that, all of us probably felt much more free to explore weird new territories during the writing process for Culture Clash. I believe the coolest thing about this trio is simply the natural way we interact when we play together, and happily that “connection” always seems to come across, irrespective of which particular musical genre we happen to be desecrating at any given moment! I suppose that’s what gave us the courage to make an album which spans (amongst other things) metal, fusion, dance music and rockabilly. I suppose now the band is just a little bit more fearless than it was when we first met. Can you describe the writing process? Where does the initial inspiration start and how do the songs end up coming together? Bryan: Actually, we all write our songs individually. 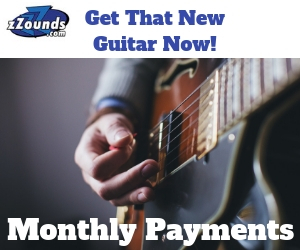 We’re all multi-instrumentalists so we can all produce a fully, fleshed-out demo on our own. Then we share it with the other guys before we go into the studio, and we really trust each other to come up with the right feel, even if some of the parts are already defined. God knows I can’t play guitar like Guthrie, and I’m just a so-so drum programmer, but when they get a hold of my parts, magic happens. We all try and do that for each other. When the band records, do you all track your parts together to capture a live feel? Bryan: Yes, the initial tracking is all live, and then we’ll go back and fix stuff where necessary. But the real bedrock of each track is a live take. We allowed ourselves a little more luxury on this record to overdub and fix stuff. The first album was very raw. We purposefully decided to polish this one just a bit more. The only exception to the live tracking on this album was “Dance Of The Aristocrats,” where Marco tracked his drums at home, but that’s a unique track because it’s supposed to be robotic in nature. And besides, there’s already a live version of that one on our last live album, Boing, We’ll Do It Live! I’m really excited for the behind the scenes DVD that’s going to be included with the deluxe edition. What can we expect to see? Bryan: It’s mostly just us hanging out in the studio, cutting the album tracks, talking about stuff afterwards and then some one-on-one interviews with each band member. You’ll see some of the takes that ended up on the record. I think it’s a fun little look at who we are and how our different personalities inform the overall band sound and vibe. 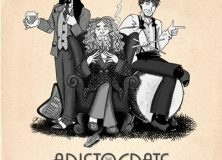 A lot of what you guys do as the Aristocrats is improvised, is it a challenge to get that perfect take in the studio? Bryan: It’s always a challenge to get the true “live” feel to happen in the studio, because you can’t just crank it up and stand close to each other and let it rip – you have to isolate each instrument, so it’s not totally natural. I think we found the right mix of “live raw” and “getting it right” on each song. Some of them just spilled out of us naturally, while others required more careful construction. Ideally, no one will know which was which but us. Guthrie, let’s talk tech a little bit. What guitars, amps and pedals did you use on the recording of Culture Clash? Guthrie: My main guitar for this record was a “Superstrat” style prototype made by the Charvel Custom Shop. This prototype has a koa body, a 24-fret baked maple neck and some custom pickups (HSH configuration) which were designed by Michael Frank Braun. (Michael previously did the pickups for the Eric Johnson signature Strat, so I figured it would be safe to trust him!) That’s the guitar you’ll hear throughout the album, with the exception of “Louisville Stomp” and “Desert Tornado,” which I played on a Gretsch (a Reverend Horton Heat signature model, to be precise). Amp-wise, I used an Axcess BS-2 buffer unit to split the guitar signal so I could use it to feed two amps simultaneously, enabling us to experiment with blending the signals in various ways during mixdown. I actually used a similar approach for the first Aristocrats album, but this time around the two amps in question were a Suhr Badger 30 head with a 2×12 cab and a Suhr Koko Boost pedal in front, to boost the lower mids and a Fender SuperSonic 22W combo, with either a Wampler Euphoria overdrive or an Analogman Sun Face fuzz in front to balance the gain level with that of the Badger amp. The only exception was “And Finally”. Something very strange must have happened during the original recording of that tune, because the end results came out sounding murky, out of phase and pretty much unusable, and we have absolutely no idea how it happened! At any rate, I decided to pay a visit to my old friend Phil Hilborne when I finally got back to the UK, and I ended up re-tracking the guitar for that tune at his studio, using a Cornford Harlequin 6W combo and a Fender Hot Rod Deluxe. Pedal-wise, I think I kept things fairly minimal during the Culture Clash sessions. I always try to record a dry guitar tone (well, dry plus a room mic) so the appropriate amount of reverb/delay can be added later on, during the mix. I think I used a DLS Versa Vibe for the solo in “Living The Dream” and a Providence Anadime chorus for a few clean guitar overdubs throughout the album. Other than that, my trusty Dunlop volume pedal was in the signal chain at all times. I suppose I should probably mention that there’s also a “choir” of E-Bow guitars in the middle section of “Ohhhh Noooo…” Oh, and the Indian-sounding drone during the “Living The Dream” bass solo was my iPhone. One of my favorite aspects of your playing is that you’re a chameleon with styles and tone. On Culture Clash for instance, you go from playing psycho rockabilly on “Louisville Stomp” to playing almost straight up metal on “Living The Dream,” and lots of stuff in between. Are you using different gear to achieve that? How are you able to shift so fluidly? Guthrie: Well, the whole concept of mixing up different styles has always made a lot of sense to me. I generally think of music as one big language, with all the different genres essentially constituting a variety of regional accents, so I suppose I hear everything as being connected in some way. I suspect that the key to playing any particular style authentically is simply to start by actually liking it and hearing a lot of it. I don’t think things like that can be faked! Gear-wise, the whole album was recorded using a relatively humble and portable guitar setup, but bear in mind that it’s possible to coax a lot of different tones from just one guitar and one amp if you’re willing to explore simple stuff like the control knobs on the guitar, and experiment with different kinds of pick attack. The only real departure for me was “Louisville Stomp”. For that tune, I used a Bigsby-equipped Gretsch through a Fender combo, which bears little or no resemblance to my regular rig, but in the case of such an atypical tune, I really wanted to come up with a “surprising” guitar tone. Bryan, I think your tone on the record is fantastic. It’s also identifiable as you, and I think that’s not as common among bass players as it is guitar players. Can you describe your bass setup and what goes into your sound? Bryan: I always run at least three tracks simultaneously. On this record my main tube D.I. was actually an ART TubePac (not the most expensive piece of gear) into a vintage Urei 1176 compressor. I like solid state compressors vs. tube “LA-2A”-type compressors for bass because they’re just faster. My second channel is a SansAmp PSA-1 preset, #32, called “jazz,” which I just use as a slight subsonic boost. And my third channel is a dirty direct channel, which is wacky: a Raven Labs PHA-1 headphone amp as a preamp, into an MXR M-80 DI/distortion box, into a crappy old dbx163 compressor. Somehow it works. And sometimes I alter that third channel to include more overdrive, sometimes with the Darkglass Electronics B3K Bass Overdrive. That’s the sound on “Ohhhh Noooo,” for example. I used the SWR Mo’ Bass BassSynth effect as a fourth channel for “Dance Of The Aristocrats.” But before any of that, it’s the Mike Lull basses I use. My ash/maple Modern 5 for bright sounds, and my alder/rosewood passive P/J 5 for darker sounds. That really lays the foundation for my bass sound on any given track. Is there a different approach to playing bass in a trio as opposed to a larger band? 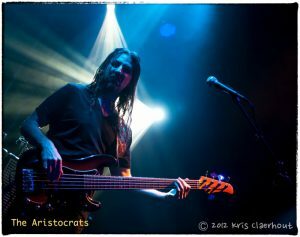 Bryan: I think that, in an instrumental trio, the bass player needs to take up more sonic space, play a little busier, add in some chordal aspects that imply harmonic progressions, and so on. But to me the main difference would be that, in a trio, you need more sonic variations on the basic bass sound to keep things interesting for the sound of the band as a whole. What’s your favorite song off this record and why? Bryan: I’m not going to say which song is my favorite because I don’t think I can be objective about that. I can tell you which song I think sounds the best, and that’s “Ohhhh Noooo.” There’s something about the snare drum, the overdrive of the bass, the guitar sound, and the composition itself on that one where something magical happened. It’s very hard to explain, but after having listened to the whole thing a million times during mixing, that’s how I feel about it. Guthrie: Agreed, “Ohhhh Noooo” just sounds expensive and generally wonderful, more so than any of us had anticipated, I think! The artwork for the new album is really interesting to say the least. Can you explain a little bit about what’s going on on the cover? Bryan: I don’t want to spoil it for everyone, but I will say that it involves a biblical reference, a Coen Brothers movie reference, and the fact that we’re each from different countries. The rest is really up for interpretation. You have toured Europe and the US, how do the audiences differ? Bryan: I’m not sure I have a good answer for this one…other than to say that the audiences in Europe are generally bigger! Outside of the major cities in America, it can be challenging doing a tour of instrumental music in the U.S. But we’re grateful to have all the support we have, and we’re heading out to do six weeks in America this summer, many in the heartland. So we’re going to give it our best shot. But really, everyone who comes out to see us has been really enthusiastic. No rotten tomatoes thrown at us yet! Guthrie: Both Europe and the US are such rich and varied territories that I’d hesitate to make any generalized comparison. In terms of what makes an audience differ from one gig to the next, I think there are probably more significant factors than whether you’re playing East or West of the Atlantic. To my mind, for instance, a New York City crowd will tend to resemble a London crowd, in many ways. Both of those are cities where people have “seen it all before,” or, at the very least, think that they have, which, at least for the purposes of this discussion, is essentially the same thing! So, I think sometimes the most important variable can be the size of the city, the regularity with which international acts come to visit, and so on. That’s not to say that those audiences are typically “better” or “worse” in any way, but stuff like that does contribute something very noticeable to the overall feel of the gig, whatever continent you’re in. Also, silly though this may sound, I firmly believe that climate plays a part, too. 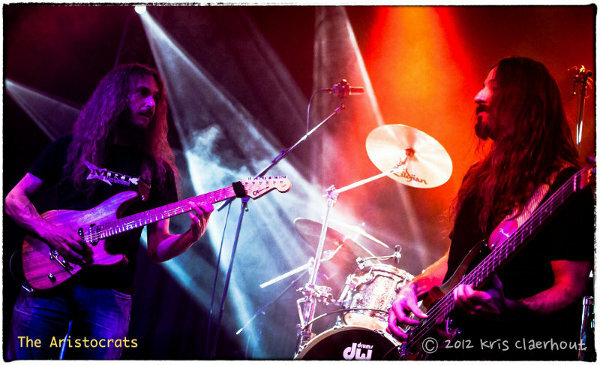 Audiences from the hotter parts of the world definitely seem to respond to live music in a more animated manner. Do you take time to meet your fans after any of your shows? Bryan: Yes! We’ll usually hang around and sign anything anyone gives us. We don’t have gatekeepers or burly security guards. Does the band have any fun stories from the road? Bryan: Yes, we have plenty, but none that we can tell you about. Actually, the idea to name the album Culture Clash (and I’ll spoil some of the album cover mystery here) came from when we were touring Europe, and we were all watching the Coen Brothers’ movie A Serious Man. There’s a scene in it that’s difficult to describe, but it features one character saying the words “culture clash” over and over again. We were saying that to each other for the rest of the tour, but that’s how it goes. I think a lot of things that we think are “fun” stories from the road are actually incomprehensible to anyone who wasn’t there. Are there any gigs in particular that you’re looking forward to on the upcoming summer tour? Bryan: Well, I’m always excited to play Nashville, where I live, though I’ll be jet-lagged pretty bad when we do that one. I always dig playing New York City and Boston, my “home” cities in the Northeast. But I’m also really looking forward to going to Florida and Texas: two major American areas we’ve never toured before, and are difficult to get to for a lot of bands like us. In fact, I think almost half the cities on this tour are places we’ve never played. We’re doing our best to get everywhere at least once, and then we’ll see how it goes from there. 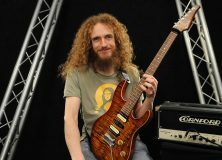 Guthrie: I’m looking forward to all the gigs. We’ve all been so busy doing other stuff over the last few months that just playing together again is a sufficiently exciting prospect for me! Having said that, Kansas City should be a particularly interesting place to play, from my personal perspective. That was the first US city I ever saw, back when I was touring with the band Asia. So, a lot of my wide-eyed “first impressions” about the States were formulated whilst I was there – right in the geographical centre of the country! I’ve never been back there since, so I’m strangely curious to find out if I still see KC in the same way, now that I’ve traveled a lot more throughout the U.S.
As a somewhat random aside, at one point during that first Kansas City gig, way back in 2001, I remember Geoff Downes greeting the crowd with the words, “Hello, Kansas,” and being bemused by the unsettlingly muted response he received. Once I became aware that we were actually playing in Missouri that night, of course, everything started to make a lot more sense. So hopefully, I’ll remember not to fall into a similar trap this summer! Learn more about the band, upcoming tours, and news at the Aristocrats web site!